We are again pulling pig to raise money for our parish’s program to support local needy people. Our next BBQ Fundraiser is this weekend. In preparation, we need your help. We are cooking 1,000 lbs of pork and it all needs to be pulled. We are going to pull it on Friday evening, May 3, from 4-8 p.m. in the kitchen in the Parish Hall. Even if you can only join us for part of that time it will be a big help. 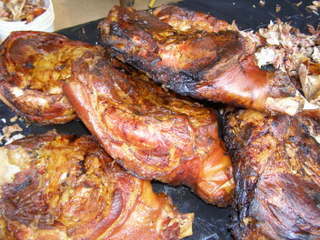 This entry was posted in Chapel Hill Knights and tagged Knights of Columbus pig picking, Pig Pull by KofC10910. Bookmark the permalink.